Comments: Mark Kappel Management offers the following Consulting Services: Fundraising, Audience Development, Marketing, Public Relations, Social Media Strategies & Web Site Design, Gala Planning and Event Planning, and Career Counseling. Products: Wholesale Promotional Product Supplier. Comments: Oasis Promotional is a leading manufacturer, distributor and exporter of quality promotional wear and other customized promotional wear and items worldwide making it your one-stop-shop for sporting and customized wear needs. We design, customize, manufacture and market women’s, men’s and kids promotional wear through an extensive network of licensing agreements worldwide. Oasis has over 4,000 products and is continuously adding to their range. They have over 25,000 customers located across USA. 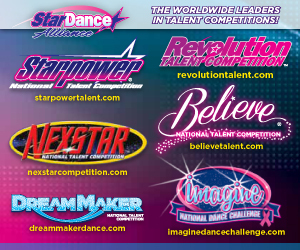 Products: Marketing & Business Solutions for the Dance Industry. Comments: Whether you own a dance studio or dance competition, direct a dance company or festival, or are a freelance teacher, choreographer or artist, Start Up and Dance can handle all of the business aspects of your dance entity, bolstering you and your organization to even greater levels of success. We utilize effective business practices that maximize efficiency and develop innovative marketing strategies and promotional campaigns. Products: Dance studio websites and performing arts marketing. Comments: The Steelteal Dance Marketing process makes it easy for you to get a professional-looking website, fast! We help you choose the best layout based on your business needs. Once designed, we help you learn how to log in and edit pages easily, while also integrating your social media channels. Our websites are also Jackrabbit ready! - In addition to the website, we offer many other marketing services.